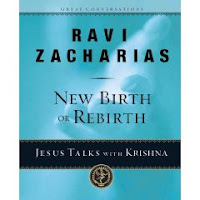 Ravi Zacharias is one of my favorite thinkers/writers. Despite his brilliant brain, he never forgets the important role the heart and emotions play in our lives. If you haven't read anything by him or listened to him, I highly recommend checking out the website of his organization immediately. I have read almost all of the books in this little series and they are all very helpful and informative in drawing clear distinctions between the major religions and thought processes in the world. They are short little books, but packed with information. He even infuses a little bit of humor (even if it's kinda cheesy). Born in India, Ravi Zacharias earned a master of divinity degree at Trinity Evangelical Divinity School before he began an international speaking ministry as a recognized authority on comparative religions, cults, and philosophy. Zacharias holds three doctoral degrees and is the author of numerous award-winning books, including Can Man Live without God? He also hosts a weekly international radio program called Let My People Think. Zacharias lives with his wife, Margaret, in Atlanta. They have three grown children. Richard: Subra—look out! That car is coming straight at us! Subramaniam: Relax, my friend. This is how people here drive all the time. Richard: Ooooh! Here comes another one—watch out! Is that guy drunk or something? Subra: Just hang on. We will be there shortly. Richard: I thought this was a divided highway… Where did all these cars come from all of a sudden? There are more coming! Subra: It is a divided highway. I’m sure that guy is just dropping off workers who live on this side of the village. To drive another several kilometers to turn around is a waste of money and time. You see, in England they drive on the left, in America on the right. But here in India we drive in the shade…or wherever else is convenient. Subra: [Laughing] Now you know why we don’t need a Disneyland in India. Driving provides all the scary rides we could ever want. What were we talking about a few minutes ago anyway? Subra: Ah yes, now I remember. It was the hardest thing I ever did, Richard—to question what was so deeply ingrained in my family’s faith. Everything in my family was built around our faith. On the most important day of my childhood, it was hard to see my mother absent from the ceremony. As you know, society in India is built on the caste system. There are four main castes: Brahmans (priests); Kshatriyas (warriors); Vaisyas (merchants); and Sudras (servants). Beyond these four castes is actually a fifth, the Panchamas, the outcasts. I was born in the south of India into the highest caste, the Brahmans. But until the defining day I am referring to, I was considered the lowest caste, a Sudra. On this day—a day that is as auspicious as auspicious can be—an initiation ceremony called the Upanayana was performed with the investiture of the sacred thread. It was only at this point that I formally became a Brahman. Richard: Sacred thread? Why would a piece of string be considered sacred? Subra: Hmm. This might be tougher than I thought. Let me back up for a moment. How much do you really want to know? Richard: Well, everything, Subra. How am I ever going to understand Hinduism unless we go deeper? You see, Richard, it’s like this: every Brahman longs for a son. We believe that unless there is a son to perform the annual ceremonies in honor of our ancestors, all six previous generations will fall into infernal misery, or hell. That’s what I had always been taught anyway. So when I was born, my father was very happy. But my mother, like every Hindu woman who gives birth, was considered defiled. On the eleventh day after my birth, a time of purification began for my mother. She was allowed to bathe for the first time since I was born, and at a formal ceremony I was given a name. It is a very important ceremony. In it, an object is brought to the ceremony that symbolizes the boy’s future. In my case, it was a silver plate holding some palm leaves. This was to suggest that my life was to be devoted to sacred studies. My mother couldn’t even attend the ceremony because she was considered unclean for another thirty days. I had been considered impure also until this eleventh day. And it was not until this ceremony that my father could hold or touch me for the first time. Richard: You know, I’m fascinated by custom and ceremony. Sometimes I think that we in the West have lost out by having so little ceremony and custom in our culture. At the same time, these customs create a lot of questions. But that’s an aside. Subra: Please, Richard. Let me finish before you jump to conclusions. Few things are ever as straightforward as they first appear. According to tradition, my name was actually chosen by my aunt, my father’s eldest sister. It had to include the name of a god, and the first letter needed to belong to the constellation under which I was born. The ceremony itself was performed by a priest who had the power to change my name if he felt the astrological charts indicated that he should do so. Richard: Wow! That’s quite a process. Subra: Indeed—it’s quite a ceremony. Relatives brought me gifts and sweets, and we had a big celebration. Richard: Does every family follow that? Richard: First and second birth in this incarnation? This conversation is beginning to sound a bit like a Hindu version of the American “Who’s on First?” comedy routine. Hey, there’s a shop up ahead. Let’s stop and have a cup of coffee, Subra. Subra: Sounds good. [Slowing car down] Would you like American coffee, Richard, South Indian coffee, or masala tea? Richard: Mmm, it’s hard to decide. You’ve spoiled me here on my visit to your country, Subra. Coffee and tea back home lack imagination unless you’re willing to pay three dollars for something foreign sounding. You know what sounds good is some chai tea—would they have that here? Subra: Funny you should ask, Richard. Chai tea is really only a term marketers have chosen to make tea sound fancy. Chai is actually the Hindi word for “tea.” So saying chai tea is like saying tea tea. Richard: Oh. Well, maybe we should have some masala chai then…I love the spicy taste. And, oh… Let’s have some of that…what do you call that dessert we had awhile back? Pukey? Subra: [Laughing] Not pukey, Richard! But close. It’s called barfi ! Remember? I can’t tell you exactly why it is named as it is, but it’s delicious—delicately made with milk, sugar, saffron, pistachios, and silver paper. Richard: Sorry, I tried to remember it by making a word association. Barfi it is, but why don’t they change the name? Barfi just doesn’t sound appetizing. Subra: You’re right. But think about it, my friend. I could list all the American food that does not sound appetizing to an Indian—hot dogs, chicken fingers, hush puppies. than the naming ceremony. Indeed, no Brahman can get married without this installation. Richard: Upanayana, is it? An American would have a hard time even pronouncing that word. Subra: It’s not easy for a twelve-year-old Indian boy either. You see, the night before the ceremony, total silence is in effect. The young boy has to be absolutely, totally silent. Have you ever tried to be completely silent for any length of time? Subra: It was very hard for me. I could not utter a sound. In the morning my parents took me to a special booth prepared for the occasion. A sacrificial fire was burning on an altar. I was completely clean-shaven—totally bald—which is never fun for a young boy. Then I was bathed. Then they gave me some sweet food to eat—I liked that part just fine—rice, clarified butter (we call it ghee), sugar, milk, and fruit. Richard: Hmm, butter, sugar, milk—a real cholesterol booster shot. Subra: It is considered food in its very purest form. My mother ate with me, which is an important point to note because this was the last time I would ever eat with her. Richard: You mean she died shortly after? Subra: No, no, no—nothing like that. In my strict orthodox upbringing, I was considered a man from this point on. As such, I would only eat with the men of the family, separate from all women, even my mother. After we ate, the formal ceremony commenced. A teacher who conducted the ceremony called on the nine planets to be witnesses then questioned me as to my desire to become an initiate. Once the teacher was satisfied with my answers, he entrusted me to the gods of water, herbs, sky, and earth. Then he prayed to all the gods and demons to protect me from every kind of evil. He then commanded me to walk as a Brahman from then on. That was now my new identity. Subra: Yes, it is, isn’t it? The climax of my ceremony involved a liturgical spell, or prayer, that was whispered by the priest to my father, who whispered it into my right ear. This prayer was so sacred that my right ear, into which it was breathed, was now considered sacred. And whenever I repeated that prayer, I was cleansed from sin. No woman and no low-caste person were ever to hear it. I repeated this mantra to myself every day. I was instructed to do so for the rest of my life. Richard: So do you still? Richard: Do you repeat your mantra every day? Richard: I’m sorry. I didn’t realize how emotional a subject this is to you. Subra: Ah…here we are at last in Mathura, Richard. Let me just pay a few rupees to this fellow to keep an eye on the car while we are gone. If we don’t, I fear the hubcaps will be gone by the time we return. Richard: Stolen hubcaps here? Even in a sacred city—the birthplace of Krishna? Subra: Yes, and then down the road they will be sold back to us by the fellow’s father. Indians are born capitalists! Richard: Sounds to me like exploitation. That seems to happen quite a bit in any religious city. Have you ever seen all the haggling that goes on in Rome or Jerusalem? Subra: Never been there myself. Mathura was always held out to me as the place to be. “Mathura, Mathura, fair Mathura.” Mathura, the birthplace of Krishna, so it is believed. Before Mathura was regarded as Krishna’s birthplace, it was sacred to the Buddhists also. It was actually a Buddhist monastic center at one time, comprised of twenty Buddhist monasteries and about three thousand monks who resided here. But as Buddhism declined in India, Mathura became a sacred spot to the Hindus. Richard: You don’t see many traces of Buddhism here today? Subra: Funny you should ask. Courtesy of an Afghan warlord, most all of the Buddhist and Hindu shrines were leveled sometime around AD 1018. Within the next few centuries, the city was determined to be Krishna’s birthplace, and then the Muslim Mughal Aurangzeb flattened the Hindu temple that had been built here and put up a mosque in its place. So over the actual birthplace, there is now a mosque. A parcel of ground protruding from the barrier of the mosque is now revered as the spot of Krishna’s birth. It is a situation a little similar to the mosque that exists on the site of the temple in Jerusalem—the only place the Jews have to worship is at the Western Wall of the temple. And like Jerusalem, this has not been a place of peace. Even now, we will be searched as we enter the main temple. And by the way, there are over five thousand temples in this small city. Richard: Human nature is the same everywhere, isn’t it? Who are these women here chanting? Subra: This is a worship center for widows. There are about two thousand widows who come here every day to chant “Hare Ram, Hare Krishna” for four hours each morning and four hours each evening. In exchange, they are given a cup of rice at noon with some lentils and two rupees, which is about five cents, and a cup of rice and lentils at dinner. If they also chant in the evening, they are paid five rupees. Four times a year they are given a change of clothes. Richard: Sounds like quite a life. Where do these widows live? Subra: They have a threadbare existence, Richard. But that’s considered their karmic debt being paid. You know about karma, yes? It’s the belief that all of one’s actions in life, both good and bad, determine one’s next rebirth after death. It’s too much to go into in depth right now. Richard: Yes, I’ve heard of karma before. Hey…what the…? Stop that! Subra: Watch out, Richard! I warned you not to pull out your sunglasses! Subra: Well, I suppose this is the right place to say those words. Here’s my handkerchief—the monkey scratched you. Richard: Any chance of getting my sunglasses back? Subra: I doubt it. Your glasses are probably on the roof of the temple now. The monkey is looking at his reflection in the lenses. You just have to be careful here. There are monkeys by the hundreds, cows by the thousands, and, as you see, donkeys as well. They all wander freely. Richard: Monkeys, cows, donkeys—without religion, there would be no businesses here. Subra: [Laughing] You might be right about that. By the way, the tastiest barfis in the country are also made here. They are called pedas. It is the same basic recipe but just a little bit sweeter and richer. You can’t eat too many—it’s a sure mouthful on the road to diabetes. But I could think of worse ways to go! Richard: Hmm, sounds inviting, but I think I’ll pass this time. Back to what we were talking about. How was your religious thinking shaped, Subra? You seem to know so much about Hinduism from an insider’s point of view. Subra: Richard, it’s hard to tell the whole story. It cost me so much. As you know, my family does not talk to me anymore, and it has been so painful. When I was in college, I started to question what I had always believed. I asked simple questions at first: Why? Who said so? Where is it written? But simple questions have a way of leading to much greater things. Religion is so important in our cultural experience—India is the most religious country in the world. And you don’t easily question what everybody around you believes. Richard: Religion just seems to be everywhere here. Subra: Yes. In more ways than you might think. We commonly use many words and expressions that come from our religion, seldom asking where they originated. For example, the word avatar, which means a divine manifestation, is not even used in the Gita, one of the scriptures of Hinduism. Yet the idea of avatar is fondly believed throughout India because of its implications. An avatar is a bodily manifestation of a higher being, even the supreme being, on planet Earth. The term is primarily used for incarnations of Vishnu, the preserver god, but it’s also used of highly influential teachers in other religions, including Jesus and Mohammed. Oh! I can say so much. Richard: The Gita? I know I’ve heard of that before. What is it exactly, and how does it differ from the Vedas? Subra: The Bhagavad Gita, or “Song of God,” is the most sacred book of the Hindus. It’s a long narrative poem, about seven hundred verses, that tells the story of a discussion between Krishna and the warrior Arjuna, who is about to fight his cousins. The flow of the Gita revolves around man’s duty, which if carried out will bring nothing but sorrow. But the poem also offers hope through the way of devotion. The Vedas, or wisdom books, are the oldest scriptures we possess—they contain everything from teachings to ceremonial instructions in detail. The Vedas are actually a collection of four books. Each book has three parts: mantras, hymns of praise to the gods; Brahmanas, a guide for practicing rituals; and the Upanishads, the most important part, which deals with teaching on religious truth and doctrines. In a different category to them are the Epics—two major tales of India. The principal one is the Mahabharata, which contains the famed Ramayana, and the Gita. Technically, these are not considered to be on the same philosophical plane as the Vedas, but practically, they are the books most loved by Hindus. It all sounds confusing at first. The Hindu scriptures are voluminous indeed. Here, let’s sit down awhile in the shade and look at the temple. Richard: Sounds complicated. I don’t know how you ever keep all the scriptures straight. Hey, did you see that? Richard: When that cow wandered into the temple, the pilgrim over there touched it and then touched his own forehead and his heart. Worship, O Cow, to thy tail-hair, and to thy hooves, and to thy form!… The Cow is Heaven, the Cow is Earth, the Cow is Vishnu, Lord of Life. Anyhow, let me continue with my story. When I started to question what I had been taught, I decided to leave home. I had no money and no place to go, so I wandered for days and weeks, finally ending up in front of a cave. The swami had taken a vow of silence and had been there a long time. There was just enough light to see that his eyes were shut. He was reflecting. Seeing him there turned my heart toward the ultimate questions as nothing else had. Richard: How did the swami survive inside the cave? Subra: Barely. Every now and then the villagers who lived nearby brought him meager rations. I stayed with the swami for several weeks, and we developed a close relationship. I kept his living quarters clean and spent many hours with him just sitting and meditating. Finally, for my sake, he wrote a few brief words, telling me that I must leave him and that I would find the answers I was seeking elsewhere. I was devastated, but he was leaving to go on a trip himself, so I couldn’t stay with him. Weeks later I returned to the cave, still seeking spiritual illumination, and I heard a voice in the night—but it wasn’t the swami’s voice this time. The voice was clear and calm, breathtaking and true. It said simply, “Follow me.” I heard it, Richard. I really heard it. I didn’t know exactly where to go after that, but somehow I knew that the same voice that spoke to me there in the cave would guide me along my way. I left the cave and met a man walking down the road who shared with me the strange and beautiful story of a babe born in a straw manger. The babe was the incarnation of the true God and had come to connect us to the true Supreme Being. It was the first time I had ever heard the gospel of Jesus Christ. I had always been taught that there is no such thing as sin against a holy God. I always thought that acts of wrongdoing were mainly a result of ignorance and that these evils could be overcome by following the guidelines of one’s caste and way of salvation. But there on the road I saw my sin as a real act of rebellion against a perfect and holy God. And, surprisingly, I discovered who it was I was searching for—the Lamb of God who takes away the sin of the world. My life…has never been the same. Subra: They would have nothing to do with me after that. Neither would my community. Richard: I’m so sorry for you. Subra: Converting to another belief system is never easy—even when you convert to the truth. With my new faith, I had a deep and lasting joy I had never known before, but I was also troubled for my family and country—so many who had grown up believing exactly as I had believed. I sometimes imagined what it would be like for Jesus to simply sit down with Krishna so they could hash it all out between them. Others would hear of the conversation and decide for themselves where truth lay. It wouldn’t be that far-fetched, you know. What I heard in the cave was a real voice. If Jesus has a voice, perhaps the historic Krishna has a voice also. Perhaps if I leaned hard enough—you know, leaned into the curtain behind time—I could hear what Jesus and Krishna would say to each other. Can you imagine that, Richard—Jesus and Krishna talking? What would each say to the other? The image of these two great figures deep in conversation stayed with me for some time. I could not shake the picture no matter how hard I tried. So one day I gave in. I sat down in a cow pasture and leaned in. Subra: As I sat in the pasture and closed my eyes, it was like a new world became visible to me. Suddenly I could see things I had never seen before. In the distance I saw a few saffron robes hanging from a tree and two figures standing in shadows talking. It was noon, already very hot and humid for the day—one of those steamy days you encounter only in India. As I strained to glimpse the men’s faces, their identities became apparent. It was Jesus, clothed in a white robe, with sandaled feet and scars on his hands; and Krishna, the youthful prince with his ever-present flute. Can you see them, Richard, in your own mind’s eye?